Minecraft 1.8 is just about finished. 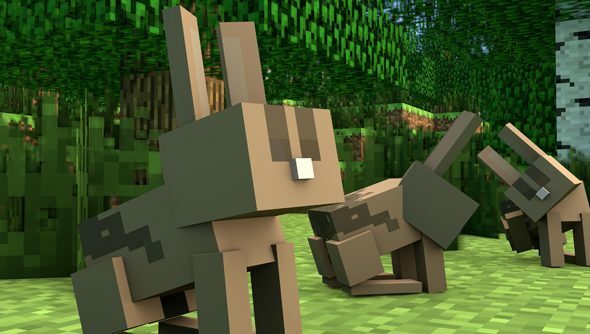 Which means sometime soon, the good work done across many weeks of snapshots will be tipped over into the main game: rabbits, endermites, elder guardians and all. Here come those few features, creeping up on us with a sickening ssss-BOOM. The world border is no longer the razor’s edge it once was. Dungeons, villages and temple spawned on the limits of a world used to be cut brutally in half, killing any mobs unlucky enough to be caught on the wrong side instantly. Now, mobs can survive in the inaccessible area beyond the border. Elsewhere, Rabbits now take fall damage. But you won’t want to be knocking them off any cliffs, because they also make sweet, sad noises when they’re hit. And daylight sensors now have two states: a day mode and a night mode. So you can now invert their signal with a click, rather than complex torch arrangements. It’s not a revolution in redstone, but it will neaten up circuits. The rest of today’s changes are optimisations and fixes galore. You can access them in the usual fashion: create a new profile in the Minecraft launcher, call it ‘snapshots’, and tick the box to enable experimental updates. Just don’t forget to backup your world saves, yeah? Speaking of which: how many of us have actually reached the world border? Perhaps our Matt’s list of the best Minecraft seeds can provide motivation.